Russian President Vladimir Putin has told his military leadership they should build up their forces in the Arctic as a priority. Commending the recent restoration of an airfield in the region, he said Russia needed to use every means to protect its national interests in the region. He was speaking after Canada announced plans to claim the continental shelf under the North Pole. Russia and Denmark also lay claim to parts of the resource-rich shelf. Mr Putin has spoken about the need to increase Russia's military capacity in the Arctic before but this was one of his most direct orders yet, the BBC's Daniel Sandford reports from Moscow. It is a sign of the growing manoeuvring by the Arctic nations for the potentially valuable resources beneath the northern seas, our correspondent says. The Arctic is estimated to have 30% of the world's undiscovered gas and 15% of the undiscovered oil. Climate change and advances in drilling technology mean these reserves are becoming easier and cheaper to exploit. At a big meeting of the country's top military officers on Tuesday, President Putin asked them to pay "particular attention to the deployment of infrastructure and military units in the Arctic". 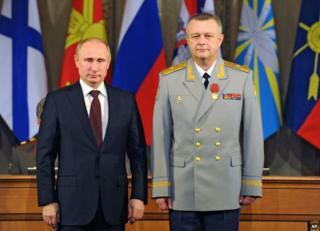 He thanked the defence staff for re-opening this summer an old Soviet airbase abandoned 20 years ago on the Novosibirsk Islands in the high Arctic. More air bases would follow, he said, in Tiksi and Severomorsk. "Next year, we have to complete the formation of new large units and military divisions [in the Arctic]," Mr Putin added. In August 2007, Russian explorers travelling in mini-submarines planted their country's flag on the seabed 4,200m (14,000ft) below the North Pole to further Moscow's claims to the Arctic. The detention of a Greenpeace ship and its crew after they protested at a Russian Arctic oil platform in September highlighted Moscow's sensitivity to criticism of its prospecting in the region. On Monday, Canadian Foreign Affairs Minister John Baird said his country intended to extend its seabed claims in the Arctic to include the North Pole. He said the Conservative government had asked scientists to work on a future submission to the UN claiming that the outer limits of its continental shelf include the Pole. Under international law, no country has sovereignty over the North Pole, one of the remotest and harshest parts of the planet. Canada applied to extend its seabed claims in the Atlantic last week, including some preliminary Arctic claims. Michael Byers, an expert on the Arctic and international law at the University of British Columbia, suggested Canada's new claim had as much to do with domestic politics as national interest. "We're talking about the centre of a large, inhospitable ocean that is in total darkness for three months each year, thousands of miles from any port," he told the Associated Press. "The water in the North Pole is 12,000 ft [3,650m] deep and will always be covered by sea ice in the winter. It's not a place where anyone is going to be drilling for oil and gas. So it's not about economic stakes, it's about domestic politics."